I’ve been using Pardot for over five years now, and I would highly recommend it as a marketing automation solution. From email campaigns to lead scoring, forms, progressive profiling, custom redirects, and dynamic content, this powerful platform can tremendously improve marketing operations for B2B companies. And, of course, using it with Salesforce couldn’t be easier. The only complaint I’ve really had about Pardot is this: it’s hard to use it to build a great landing page. Now, Pardot does have landing page functionality. But personally, I’ve found it to be fairly cumbersome and rigid—at least when you compare it to other landing page tools out there. If you’ve got developers on staff—with plenty of time on their hands—you’ll probably be fine. But building landing pages in Pardot felt far from intuitive to me. The interface was more like a word processing program than a design tool, page elements were limited, and getting the look I wanted was difficult unless I wanted to dig into the HTML. On top of that, some of their basic page templates weren’t even mobile-responsive. Then I discovered a workaround—a way to create and customize high-converting landing pages for Pardot in 15 minutes or less, with no coding required. The secret? Don’t build your landing pages in Pardot. Instead, build them in Leadpages. Then, integrate them with your Pardot forms in a few simple steps. In my experience, this is actually faster than doing everything inside Pardot, and it gets you better results. “We are big Salesforce (for CRM) and Pardot (for marketing automation) users at Four51, but we were frustrated with our inability to create custom landing pages or experiences in a mobile responsive way. Today, I’m going to show you exactly how this works. But first, let me give you a little background on where I’m coming from and why this turned out to be the best solution for me. A little less than a year ago, I was working for a Fortune 300 company in Kansas City managing digital marketing and demand-generation programs. All of the campaigns I was running required custom landing pages. I say required because from previous testing, I knew that every campaign I added a custom landing page to saw conversion rates increase between 10% and 70%. When you’re seeing results like this, leaving dedicated landing pages out of your campaigns is just not an option. But that meant that for each new campaign I had to either wait for my development team to create the landing pages or do some hand coding myself if I could find the time. This slowed down the campaign creation process. Many times, I was forced to reuse existing landing pages to meet deadlines, knowing all the while that my results could’ve been better with the ability to customize more. Not a good feeling. I kept thinking there had to be a better way to build landing pages for Pardot, and after doing some research, I discovered Leadpages. An hour after signing up for Leadpages, I had created and launched five new landing pages. The new landing pages were much better looking than the ones I had previously created using Pardot, and they took a mere fraction of the time to complete. I noticed one thing, however: Leadpages didn’t officially integrate with Pardot. Was that going to be a problem? While Leadpages does not officially integrate with Pardot (their API is not easily accessible to third-party developers, if you’re curious), you can use our Copy/Paste integration option to add custom form code to your pages. I’ll show you how in brief below. If you’d like to set this up right now, I’d also recommend you check out our support article on connecting Leadpages to Pardot, which breaks the process down in even more detail. Step 1: Create a custom form template in Pardot. In your Pardot account, navigate to Marketing › Forms › Layout Templates. Then, click Add Layout Template and name it—something like “Leadpages Form Template,” for instance. Create and save your new layout template, and you’re ready for the next step. Step 2: Assign the new layout template to your form. Create a new form in Pardot (or edit an existing one). In the form wizard, navigate to the Look and Feel section and choose the form layout you just created as the template for the form. Decide what you want the Submit button to say, customize your button text, and save the form. Step 3: Publish your form to your Leadpage. From the overview screen for the form you’ve just created, click View HTML Code and copy the entire embed code that appears. What happens next depends on whether you’re using one of our hundreds of standard templates or our dozens (and counting) of drag-and-drop templates. Drag an HTML widget where you’d like your form to appear—either onto your landing page directly or onto your drag-and-drop Leadbox (after deleting the default form field). Then, paste your Pardot form’s code into the HTML box. You can use our Other Copy/Paste integration. While editing the form on your landing page, choose Integration Settings from the sidebar and “Other Copy/Paste” as your integration. Then, paste the code you copied from Pardot into the “HTML code” box. Now you’re ready to use the lead-generating powers of Leadpages and Pardot combined. That means you can route any leads that pass through your Leadpages landing pages into your Pardot automation rules and drip programs. You get all your scoring, filters, progressive profiling, reporting, and analytics on the back end, with Leadpages’ ultra-effective landing pages and popup forms up front. 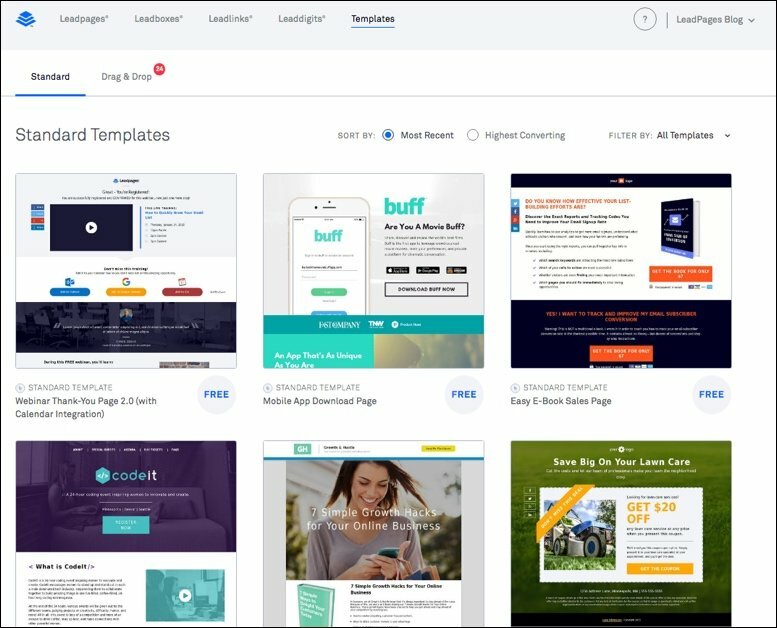 In other words, you keep all of the functionality that your native Pardot landing pages would have, but with a much more efficient and user-friendly landing page tool. Are you currently using Pardot for marketing automation (and perhaps struggling with the landing page function)? Our team would love to show you exactly how you can improve your team’s productivity and conversion rate, all while cutting down the time and resources you spend on landing pages. In fact, they’d be happy to show you during a one-on-one demo. To schedule your Leadpages demo, just call our sales team at (855) 835-3877. Does your team use Pardot? What’s your favorite feature? Tell us in the comments.